At the first three Gatherings, City Lore worked with artists from a wide range of poetic traditions. Through these collaborations, performances, dialogues, and panel discussions, we were inspired to develop a more focused initiative on contested and endangered languages. 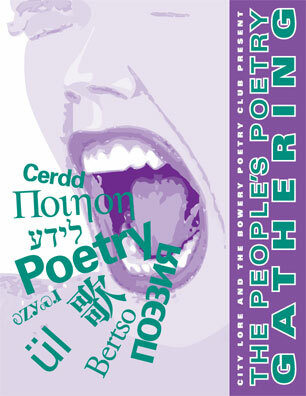 The 2006 program included a keynote by poet Robert Bly reading from his translations and poems, cosponsored by Poets House; a program at the United Nations with Gathering poets joined by delegations from around the world in a tribute to poetic traditions that are increasingly threatened in our globalized society; Harpsong: Celtic Poetry and Music presenting Belfast performance poet Gearóid MacLochlainn, award-winning Scottish traditional band Cliar, and Wales’ National Poet Gwyneth Lewis. Artists working in indigenous languages from the USA, Asia, and Australia were also featured such as Alaskan Tlingit poet Nora Marks Dauenhauer. The Gathering closed with a Poetry Dinner dedicated to Basque music, poetry, hard cider, and cuisine. National Heritage Award-winning Basque bertsolari poets from San Francisco, Nevada, and Wyoming performed traditional, musical, poetry duels with artists including Johnny Curutchet, Gracian Alfaro, Jesus Goñi, and Martin Goicoechea. In addition to the festival, the Gathering launched our Endangered Poetry Initiative, a long term project to feature, disseminate, and document poetry in threatened and endangered languages. The program book from The Stones of Civilization at the United Nations.